Circular Connectors are electrical plugs and receptacles, with multiple contacts housed within a circular body. The connector housing or body can be manufactured from materials such as Aluminium, Stainless Steel, Nickel Aluminium Bronze and Composite. They are often selected by designers due to their high performance in extreme environments of vibration, shock, temperature and pressure or where high levels of protection against electromagnetic interference (EMI) and radio frequency interference (RFI) are required. Circular Connectors are widely used in military, aerospace and harsh industrial applications. Common standards include MIL-DTL-38999, 26482, 5015, 83723, EN2997 and ESC10. This article provides definitions of common terms used in the Circular Connector industry. It is therefore intended as an informative guide for engineers and buyers. You can download this document as a handy pdf guide here. Accessories – Items such as cable clamps, backshells, gaskets or any other hardware that can be added to the connector. Alternate Rotations - Rotation of either an insert or designated key/keyway locations (Alternate Keying) in a connector shell to a different angle than normal position. Allows for variations of mating the two halves of a circular connector plug and socket pair. Anodized - Formation of a protective, insulating oxide layer on metal bay electrolytic action. Arc Resistance - The characteristic of insulating materials to resist carbonization (also known as tracking) of the material surface between electrodes resulting from voltage breakdown. Attenuation - (this term is used in filters). The ratio of the input to output power levels in a network (transmission line) when it is excited by a matched source and terminated in a matched load. AWG – American Wire Gauge. A standard of wire diameters, such as 16AWG. As the numbers get smaller so does the diameter of the wire. Back-mounted - When a connector is mounted from the inside of a panel or box with its mounting flanges inside the equipment. Backshell – An accessory mounted to the rear of a circular connector to give strain relief and/ or sealing, such as AS85049. Cable Clamp - An accessory fitted to the rear of the connector to clamp wires into position and provide protection against pulling force to the wires. See also Strain Relief. Circuit - A complete path or electron flow from the negative terminal of a voltage source through a conductor and back to the positive terminal. Closed Entry Socket Contacts - A female contact designed to prevent the entry of a pin or probing device having a cross-sectional dimension greater than the mating pin. Coaxial Cable - A high-bandwidth cable consisting of two concentric cylindrical conductors with a common axis that is used for high-speed data communication and video signals. Contact – The conductive element in a circular connector. These can be pins, sockets, Co-ax, Tri-ax, Fibre optic and Hyperboloid. Compliant Contact - A press-fit type of contact used to attach to a printed circuit board. Has an eyelet end. Conductivity - The ability of a material to conduct electric current, expressed in terms of the current per unit of applied voltage. It is the reciprocal of resistivity. Contact Durability - Endurance measured by the number of insertion and withdrawal cycles that a circular connector can withstand and remain within its specified performance level. Contact Engaging and Separating Force - Force needed to either engage or separate pins and sockets when they are out of connector inserts. Values are generally established for maximum and minimum forces. Contact Resistance - Maximum permitted electrical resistance of pin and socket contacts when assembled in a connector under typical service use. Contact Retention - The minimum axial load in either direction that a contact must withstand while remaining firmly fixed in its normal position within the connector insert or housing. Continuity - A continuous path for the flow of current in an electrical circuit. Corrosion - The destruction of the surface of a metal by chemical reaction. Coupling Torque - Force required to rotate a coupling ring or jackscrew when engaging a mating pair of circular connectors. Crimp Contact - A contact where the wire is terminated using a crimp tool. Dielectric - Any insulating medium that intervenes between two conductors. Dielectric Withstanding Voltage - Maximum potential gradient that a dielectric material can withstand without failure. Discontinuity - A broken connection or the loss of a specific connection characteristic. Edge Connector - One-piece receptacle, containing female contacts designed to receive the edge of a printed circuit board and interconnect on which the male contacts are etched or printed. The connector may contain either a single or double row of female contacts. Edge board Connector - A connector that mates with printed wiring running to the edge of a printed circuit board. EMI – Electro Magnetic Interference. 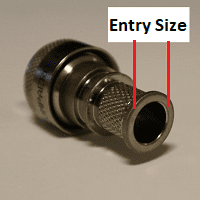 Entry Size – A military standard to designate the diameter of the connector backshell cable entry. Feed-through - A conductor that connects free plugs either side of a panel. Also called a bulkhead feed-through. Fibre Optics - A data transmission medium consisting of glass fibres. Light-emitting diodes send light through the fibre to a detractor, which then converts the light back into electrical signals. Filler Plug – A plug used to block off un-populated cavities in the rear grommet. First Article - A sample part or assembly manufactured prior to the start of production for the purpose of assuring that the manufacturer can manufacture a product that will meet the requirements. Front-mounted - A connector is front-mounted when it is attached to the outside or mating side of a panel. These can only be installed or removed from the outside of the equipment. Front Release Contacts - Connector contacts are released from the front side of the connector and then removed from the rear of the connector. The removal tool engages the front portion of the contact and pushes it out the back where it is removed by hand. 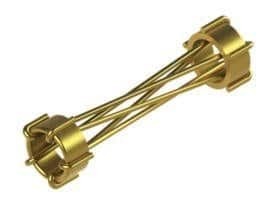 Harsh or Hostile Environment Connector - A connector designed and engineered for operation in hostile environmental conditions, such as extremely high temperatures of 677°C (1,250°F), extremely low temperatures of absolute zero and severe water-tight conditions. Header - A feed-through device that introduces a conductive path through an insulating plate. Hermetic Connector – Connector that uses a glass seal to hold contacts and can withstand high temperatures, vibration and pressure or vacuum differentials between the front and rear of the connector. Hermaphroditic Connector - Interconnecting device in which both mating parts are identical at their mating surfaces. Hermaphroditic Contact - A contact in which both mating elements are precisely alike at their mating face. Hyperboloid Contact - A unique socket contact design with a twisted inner grid. Socket cylinder within the female contact has several equally spaced longitudinal beams twisted into a hyperbolic shape. As the male pin is inserted, axial members in the female half deflect, imparting high current flow across the connections. Input/Output Connector - A mating pair of connectors used to carry signals into and out of a panel-mounted subsystem. An example is a connector pair that interconnects the individual back panels in a large array of panels. Insert Retention - Axial load in either direction that an insert must withstand without being dislocated from its normal position in the connector shell. Insertion Force - The effort, usually measured in ounces, required to engage the mating components. Insertion/extraction tool – A tool used to aid the fitment of the contacts into the circular connector. Interchangeable - Characteristic of connectors in which one manufacturer’s connector can be replaced by the connector of another manufacturer and provide the same function in the same panel space. Intermateable - Characteristic of connectors in which a connector half manufactured by one connector will mate directly with a connector half manufactured by a different company. Keying - Mechanical arrangement of guide pins and sockets, keying plugs, contacts, bosses, slots, keyways, inserts or grooves in a connector housing, shell or insert that allows connectors of the same size and type to be lined up without the danger of making a wrong connection. Lanyard - A device attached to a connector to permit uncoupling and separation of connector halves by a pull on a wire or cable. Life Cycle - A test that indicates the time span before failure. The test occurs in a controlled, usually accelerated, environment. Mass Termination - Method of termination in which terminals that pierce flat cable insulation without stripping to cold flow mate with conductors and form a metal-to-metal joint. Mating/De-Mating Force – The force required to couple or de-couple a connector. MIL Spec – A military specification that circular connectors are designed, built and qualified to, such as MIL-DTL-38999, MIL-DTL-26482, MIL-DTL-5015. Motherboard - A printed board used for interconnecting arrays of plug-in electronic modules. Operating Temperature - Maximum internal temperature resistant capabilities of a connector in continuous service. Outgassing - De-aeration or another gaseous emission from a printed board assembly (printed board, component or connector) when exposed to a reduced pressure or heat, or both. Panel-mount - Fixing a connector half to a board, panel or frame. 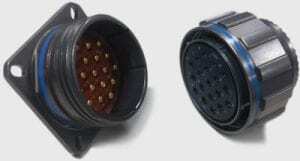 Usually, the female portion of the connector is mounted, and the male half is the removable portion. Plated Through-Hole - A hole-formed deposition of metal on the sides of the hole and on both sides of the base to provide electrical connection from the conductive pattern on one side to that on the opposite side of the PC board. Poke-Home Contact - Term applied to a male or female contact to which a wire has been permanently affixed prior to the assembly of the contact into the insert. Positioner - Device attached to the crimping tool to position conductor barrels between the indenters. Potting - Sealing of a component (for example the cable end of a multiple contact connector) with a plastic compound or material to exclude moisture, prevent short circuits and provide strain relief. Pre-tinned - Solder applied to an electrical component prior to soldering. Pre-tinned Solder Cup - Solder cups with inner surfaces that have been pre-coated with a small amount of tin-lead solder or RoHS approved solder. Press-fit Contact - Either a solid pin or a pin having a compliant member that makes an interference connection with a through-hole on a PC board. The pressure developed between interconnecting surfaces is sufficient to provide gas-tight electrical reliability without the use of solder. Qualified Products List (QPL) - A list of commercial products that have been pre-tested and found to meet the requirements of a specification, especially government specifications. Quick-disconnect Coupling - A design feature, apparent in the quick-disconnect connector. It permits relatively rapid joining and separation. Ramp - The sloped channel that accepts the detent pin in a bayonet connector. Rear Release Contacts - Connector contacts are released and removed from the rear (wire side) of the connector. The removal tool engages the contact from the rear and pulls the contact out of the connector contact retainer. Rear Seal - A Design feature that provides an environmental seal at the rear of the plug or receptacle. Removable Contact - A contact that can be mechanically joined to or removed from an insert. Usually, special tools are required to lock the contact in place or remove it for repair or replacement. RoHS (Restrictions of Hazardous Substances) - The RoHS Directive bans the placing on the EU market of new electrical and electronic equipment containing more than agreed levels of lead, cadmium, mercury, hexavalent chromium, polybrominated biphenyl (PBB) and polybrominated diphenyl ether (PBDE) flame retardants. Strain Relief – An accessory fitted to the rear of the connector to clamp wires into position and provide protection against pulling force to the wires. Scoop Proof - Design feature whereby exposed contacts of a connector cannot be touched or damaged by any portion of the mating connector. Serrations - Small grooves or indentations within a terminal wire barrel that increase the tensile strength and electrical conductivity of the crimped termination. Shell – The outside case of the connector, these can be a metallic or non-metallic construction. 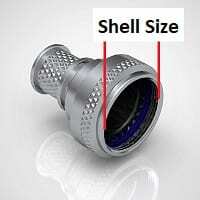 Shell Size – A military standard to designate the diameter of the connector or backshell. Solder Contact – A method of connecting the wire to the contact. Soldering is an economical, versatile and fast termination method. Splice Connector - A joint connecting conductors with good mechanical strength and good conductivity; a terminal that permanently joins two or more wires. Surface Mounting - The electrical connection of components to the surface of a conductive pattern without utilizing component holes. Termination Band – A stainless steel band use to terminate cable shielding to the rear of the backshell to provide EMI/RFI shielding. Thermal Shock - The effect of heat or cold applied to a material at such a rate that non-uniform thermal expansion or contraction occurs. In circular connectors, the effect can cause inserts and other insulation materials to pull away from metal parts. Thermocouple Contact - A contact of special material used in connectors employed in thermocouple applications. Materials often used are Iron, Constantan, Copper, Chromel and Alumel. Tri-Start - A triple start thread that enables fast coupling and disconnect of connectors, as used on MIL-DTL-38888 Series III connectors. Tuning Fork Contact - U-shaped female contact that resembles a tuning fork. It can be stamped or formed. Umbilical Connector - A connector used to connect cables to a rocket or missile prior to launching, and which is removed from the missile at the time of launching. VAD – Value Add Distribution, a distributor such as NYKCS that has been approved and qualified to assemble a manufacturers product. Wire-Wrapped Connection (also known as Solderless Wrap) - A solderless connection made by wrapping bare wire around a square or rectangular terminal with a power or hand tool. NYK Component Solutions is a leading franchised distributor of Circular Connectors and Accessories. For more information about our range of approved products including D38999 Series III from Conesys and backshells from Compaero please contact us today.